Most days things are really mellow here at the gate, but when I woke up this morning I learned we were expecting 50 mph winds! That’s no fun in an RV even if you aren’t working, and certainly not fun when you have to open and shut a heavy gate a hundred or more times a day. 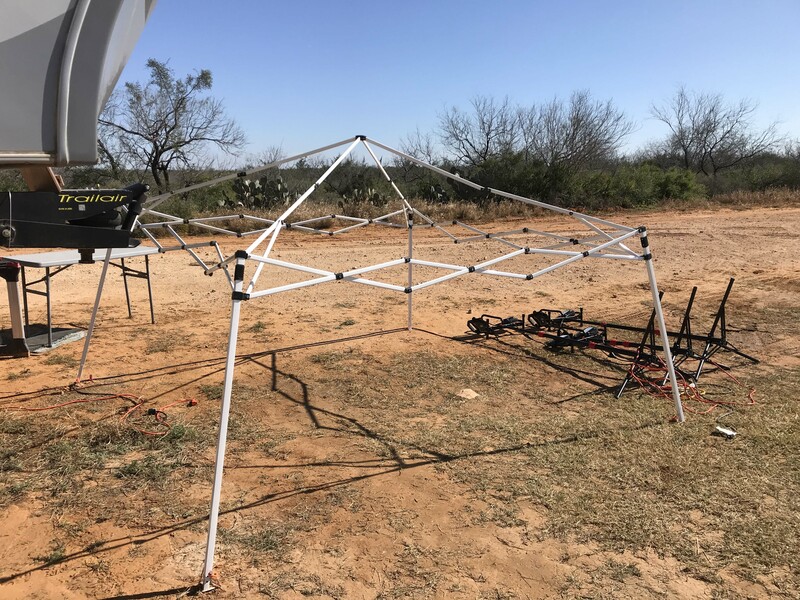 The first thing Lee did was take the top and side walls off our our EZ Up shelter structure which definitely wouldn’t have stood up to the wind. 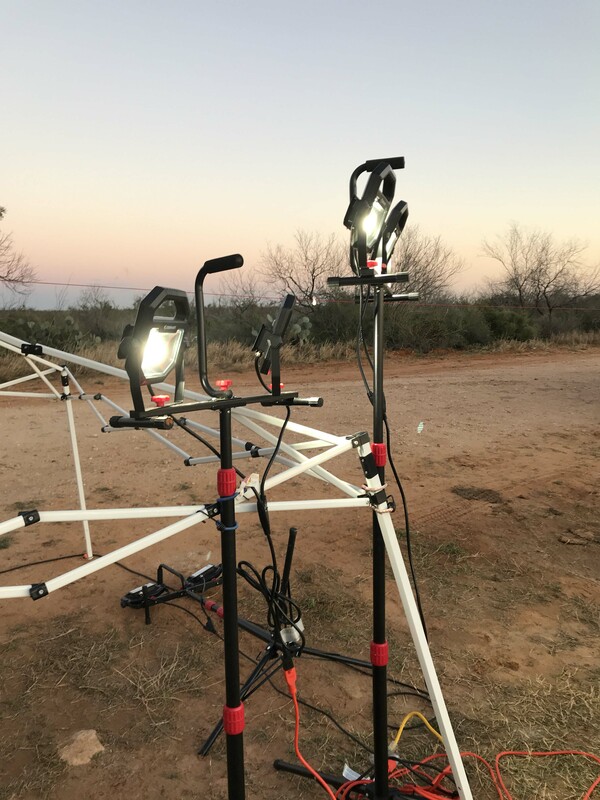 He also laid the light stands down, which works fine in the day, but at night is going to be a problem trying to do this without light. He also tried to find a spot where the motion sensors could be without “falsing” too much. That was a bit of a lost cause though and we had lots of ding dongs and no trucks. We also had lots of trucks coming in and no noises at all, so basically you have to be pretty vigilant. That’s where having a front living room model helps us, because at least I can sit in the forward desk section (which faces the road) and sort of see. Still miss people, no way around it, and when things are like this they just need to be patient. Shelter without the sides or top. You can barely see the motion sensor in a box in the bottom of the sign by the “Y” in Security. This actually works really well! Once I see the person I have to get out the front door and as anyone know who has an RV, opening the door in high wind is a pain. You really have to hold on, because it catches like a sail and the handles in my RV aren’t that big to get a good grip. And of course the holes for the drop rods at this particular gate aren’t deep enough for the rods to really get down there, so unless you position it very carefully it starts to creep on you in the wind. If we were in a gate that didn’t have to stay closed it wouldn’t be a big deal, but I am wrestling with the gate in the wind which can be hard to close. All in all, not fun, but we will see how it goes. Thankfully I have been feeling better the last couple of days, so at least I am not adding stomach pains to all that but definitely not looking forward to the night. Jack did OK in the wind, but it was hard to get him to settle enough to go to the bathroom. As I started writing this it’s around 1pm and I am the one working because I sent Lee to get our mail. 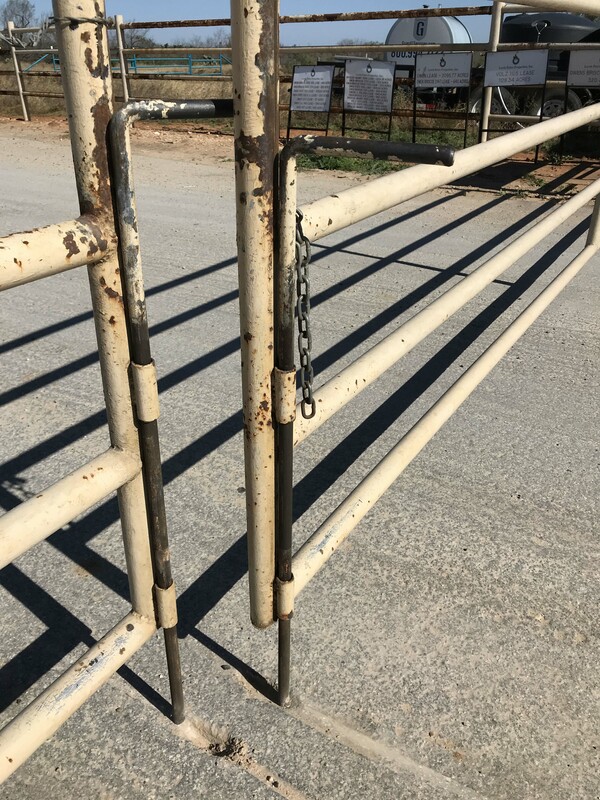 We have a couple of choices when we are working gates and they depend on both what we are getting, and how comfortable we feel with the local post office. Many small post offices take things general delivery for free, but not all do, and we have had mixed results. The safest bet is to send things to a UPS store, but that costs between $2 and $5 per item when you pick them up, which can add up. It’s safer because not all post offices will accept UPS/Fed Ex deliveries and we never know how people will send stuff. Don’t get me wrong, we love getting presents, but when people say “How can I send you something?” this time of year it’s a bit complicated. We can have them sent to our mail service and pay double shipping (best for cards), or sent to a UPS store with our names on them (very important it says both our names because we never know who will be picking it up), or general delivery to post office with our names. An added wrinkle of the small local post offices is they often have limited hours, but all things being equal that is my preference if we have gone in and talked to them and they are fine with general delivery. After a couple of hours I was definitely tired of fighting the wind but I am EXTREMELY grateful that the wind is blowing from the highway so it’s hitting the rear of our rig and not the side. And thankfully so far doesn’t have a ton of dust and grit in it. That is the absolute worst, and like working in a sandstorm, but so far at least we’ve been lucky and the dirt is blowing but farther down the road. I’ve also taken a moment to talk to some of the regulars and let them know the challenges we would face tonight. With the motion sensors not working properly, I let them know to feel free to go ahead and honk, and also told them I would do the best I could. No way am I sitting outside in this all night, so folks will just have to be patient. If this was a regular gate I would just open them up and whoever I missed I would get on the next go round, but opening and shutting it every time definitely adds a wrinkle. The wind just got worse and unfortunately it was busy. There are lots of hunting leases on this property, and for some reason I had numerous hunters show up. Generally they are not in our system and don’t really understand the gate etiquette like the oil workers so they always take longer to process. I also had one truck driver stop and tell me that six miles down the road there was a fire which had spread in the same direction as us and was beyond the gate. The fire department was on site, which was good, but with this wind I would imagine it would be very hard to contain. I notified my supervisor and since there wasn’t anything else I could do just sort of kept an eye out. At one point the dog wanted to go out and pee and that was pretty chaotic. 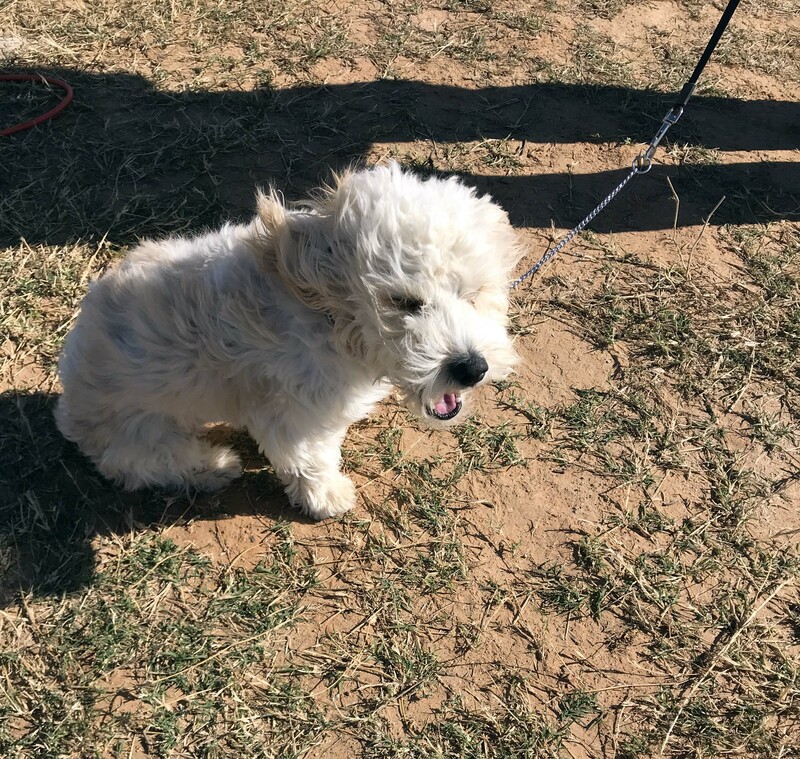 I had trucks, crazy wind, and the dog to worry about. After he went I put him back inside and thankfully he decided to take a nap. He didn’t seem to mind the wind, if anything he was enjoying it, but I was not having fun standing out there with him. The darker it got the worse the wind blew, and I was struggling not only with our RV door but also with the gate. It kept blowing open, and although I kept shutting it I saw that the holes in the ground the metal rods went into were somewhat shallow. The owner’s son came through and I took the opportunity to tell him I was struggling with the gate but his response was very cold. He said “You need to keep the gate closed, I don’t care about the wind” and when I tried to mention the trouble with the gate itself he couldn’t have cared less. As much as I appreciate the situation from his perspective I have to say that his tone and the way he talked to me was definitely not OK. I called my boss and let him know and he was really nice about it. 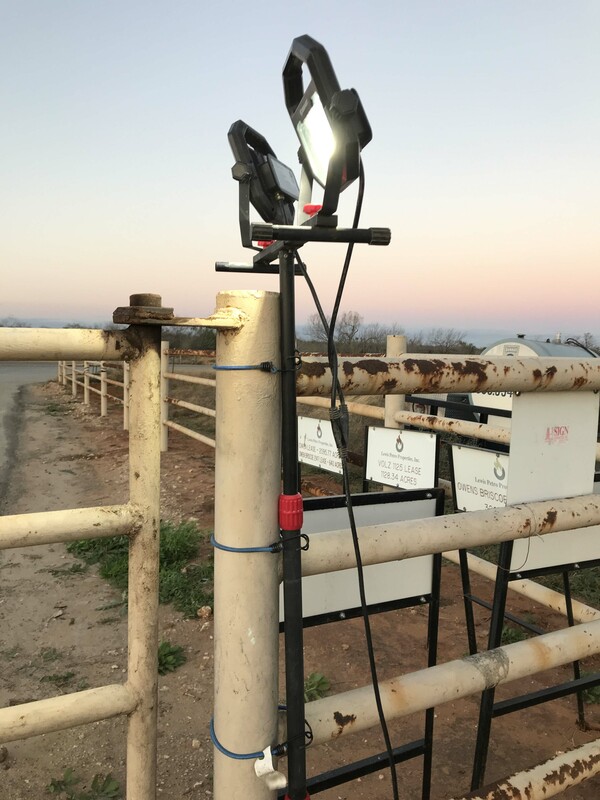 He gave us some suggestions for strapping lights to the gates to get through the night and made me feel a lot better about the whole thing. It’s hard to see, but the holes that the gate go in are very shallow. The one of the right in particular slips out and just starts sliding as the wind pushes it. Lee did a great job bungee cording the lights and it worked beautifully. Thankfully right around the time it got dark, the wind died down a little. It’s really nice here at night, which is why I like working the night shift, and in between trucks its is very quiet and still. Occasionally I hear a coyote off in the distance, or the rustle of a nearby cow, but it’s crisp, and clear and beautiful and I really don’t mind staying awake. Most nights I really love but 51 degrees and wind at 20 mph is just not so fun. So far at least the wind has been a rare occurrence and I am grateful for that. I just have to physically work so much harder when it’s windy and of course there is some increased risk of getting hurt. The best thing that came out of the windy day though was that Lee finally bought himself a weather station. He has wanted one of these for 5 years now, and decided to go ahead and buy himself an early Christmas present. Since it is absolutely work related we will be able to deduct it from our taxes, but even if it wasn’t he has waited a long time to purchase it, and after the last couple of days the last thing I want is to get caught with our pants down on a windy day. It is a very complicated machine, so I am going to go ahead and let him explain it to you. I will say that if you have a guy in your life that is hard to buy for this may be the present for him. Oh, and the station has a widget on this blog that now shows you our general location and the weather in our area. That was pretty cool! 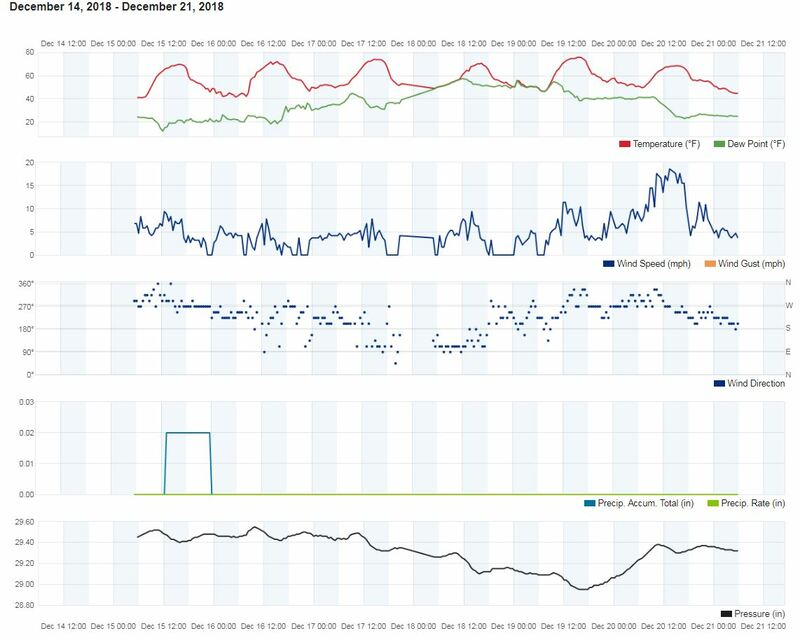 I already had a small Acurite weather set that included a wireless sensor outside, another one that I kept in the basement to keep an eye on the water lines when it got really cold, and of course inside temp. It also did humidity, but what I really wanted was an anemometer. I always wonder what speed the wind is blowing, but these are kind of pricy so I waited and waited. I finally broke down and got one when I saw that we were going to have a couple of days of really high winds. It’s the Acurite 5 in 1, model #01536. 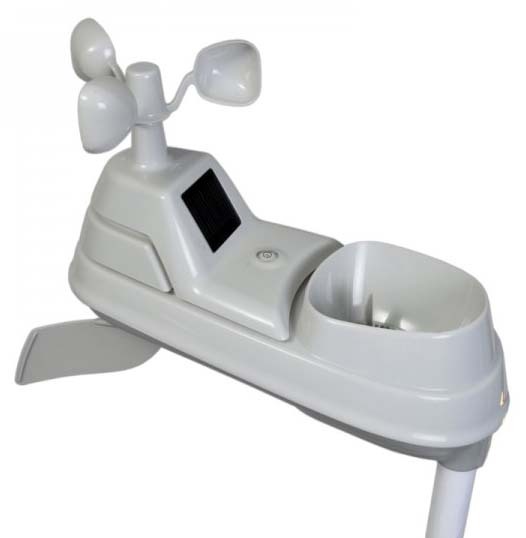 The outside unit does temperature, wind speed and direction, barometric pressure, humidity, and rain. 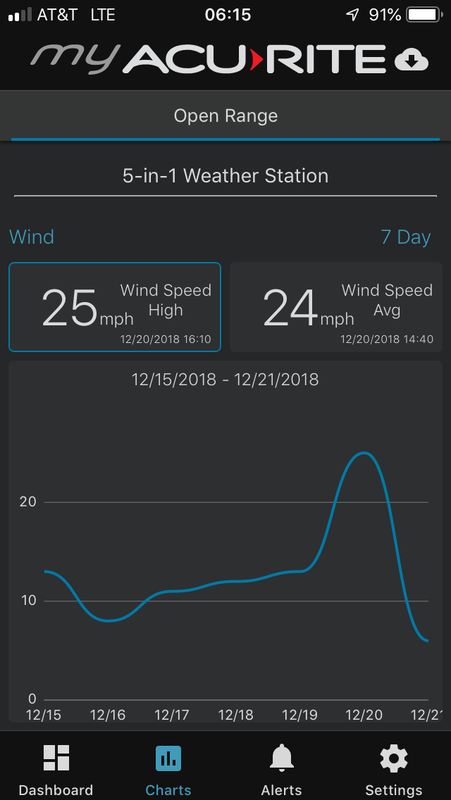 There’s a nice indoor display that shows current wind direction as well as the 2 previous wind directions, wind speed, and the peak wind speed for that day. 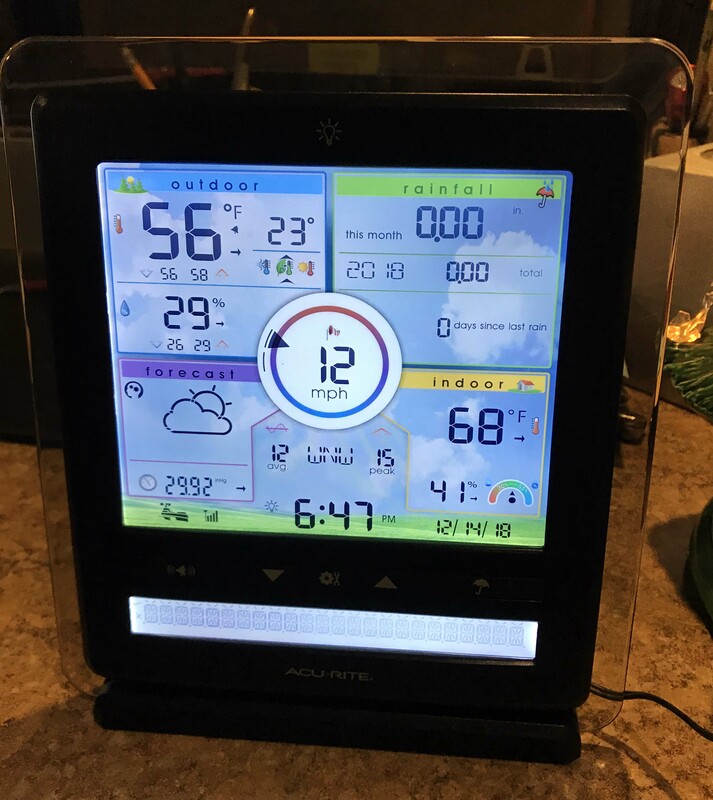 The outdoor temp display includes current temp, a heat index calculation, wind chill, dew point and humidity, the high and low temp and humidity for that day, and a trend arrow telling you if the temp and humidity are rising, falling or holding. The rainfall indicator shows you how much rain you’ve had that day, week, month, or year, and how many days since the last rain. The indoor indicators include temperature and humidity, along with a trend arrow and humidity “comfort” meter, and if you get additional wireless sensors (you can have up to 3), will display information for those as well. There’s a forecast area that tells you the barometric pressure with a trend arrow, and gives you a little icon with it’s best guess for the forecast. And finally there’s a neat little ticker at the bottom that constantly shows a whole slew of data; Heat index, wind chill, dew point, “feels like” temp, daily, weekly, monthly and all time highs for temp, humidity and wind, the phase of the moon, rainfall data, and battery and wireless signal information. You can see the mounting bracket in the image below. The sensor has a mounting hole on the bottom and it just slides onto the mounting bracket or the pipe you use. There are holes in the side that allow you to put two screws through the body of the sensor into the pipe to secure it, but I chose not to use them. The pipe slides all the way up the body of the sensor, so there’s no danger of it falling off, and it’s a snug enough fit that it won’t spin on the pipe, but I will keep an eye on it to see if it gets looser over time. I don’t want to have to find storage space for the sensor attached to the pipe, and I don’t want to have to put the screws in and take them out every time we move. The higher you can get it the better, the NWS recommends thirty feet, which is a little unrealistic for a rig. 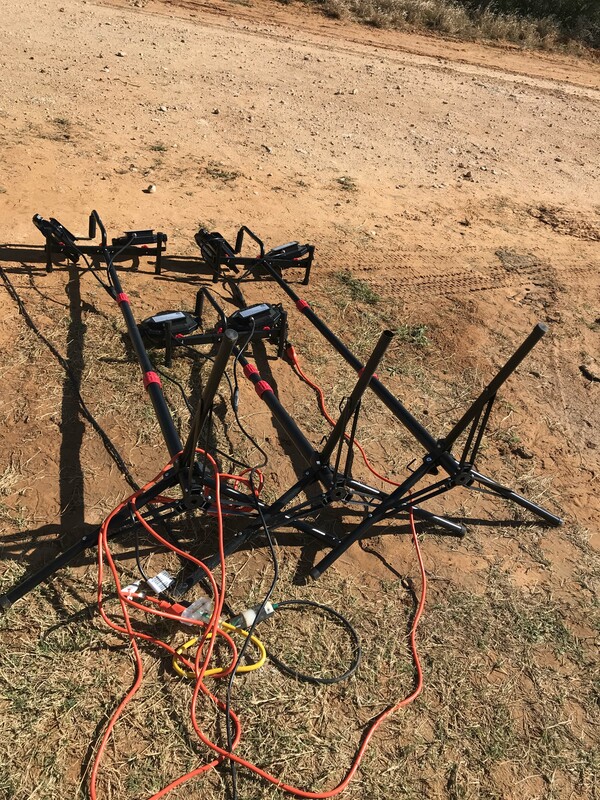 I chose to use a 5′ length of PVC pipe, attached to our rear ladder with stainless steel U-bolts, with about two feet of pipe on the ladder and the sensor at 3′ above the rig. 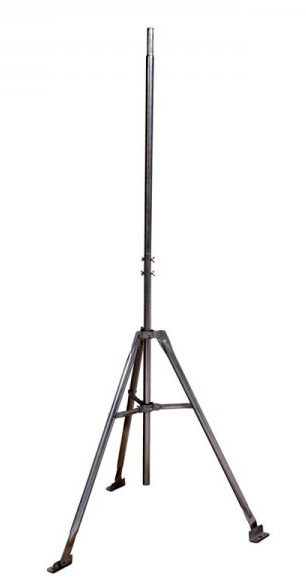 We’re 12′ high, so that puts the sensor at 15′, which is high enough, I think. And there are no obstructions within 6′ of it, so I can get accurate wind readings. 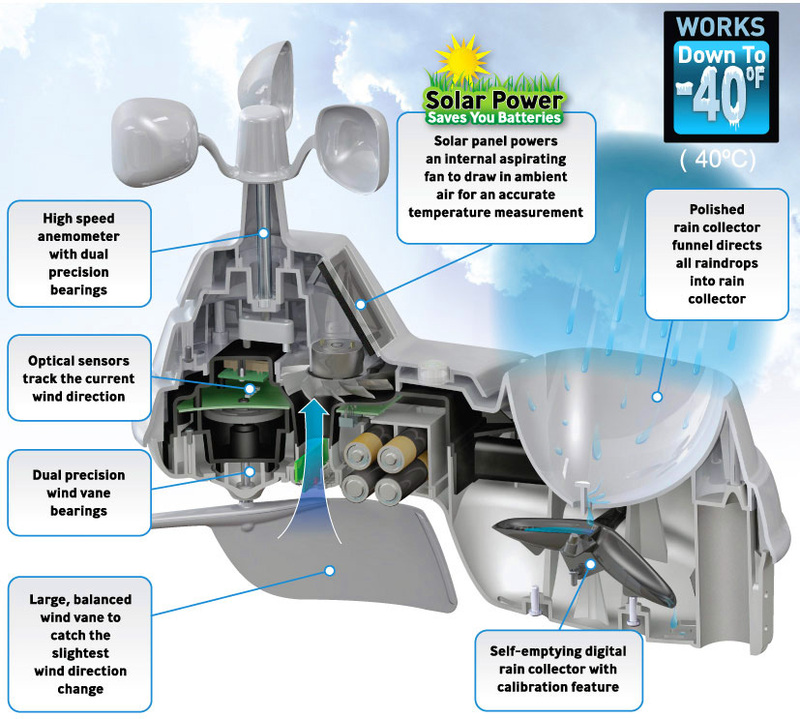 In the picture below you can see the top of the sensor, which shows the solar panel, and the rainfall collector. There’s also a tiny little bubble level between them to help you make sure it’s level when you install it. And in this image below, you can see the battery compartment, the vane, and where the pipe slides in. Here it is mounted to our ladder. For those interested in how it works, here’s a picture showing the interior. 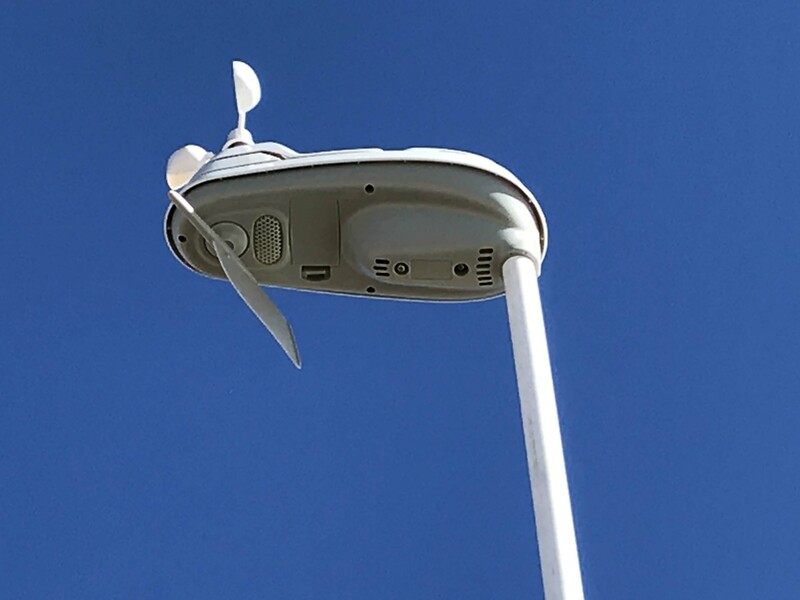 I particularly like the solar powered aspirating fan that keeps the insides from overheating in the sun and keeps it dry in high humidity. I’m curious to see how long that fan holds up, but it can be replaced by me if it goes bad. I also like the fact that the vane is on bearings. There’s also a debris screen in the rain collector, although that would need to be cleaned if it were under trees for any length of time. 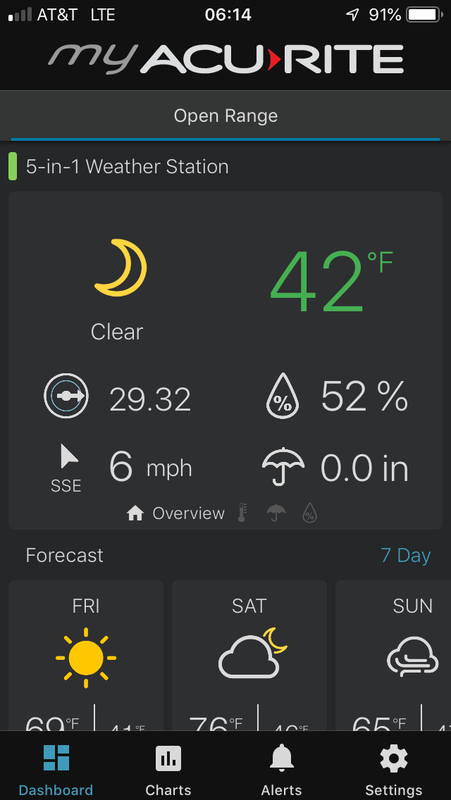 In addition to the indoor display, you can get software that will upload all of the data to Weather Underground, and that will allow you to look at the data easily in charts and graphs. 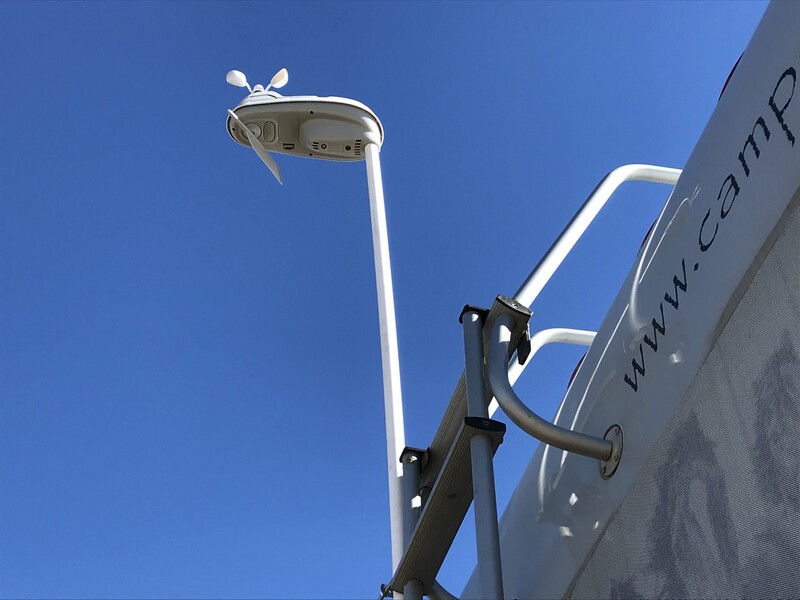 Acurite offers a device called the Access, which allows you to integrate the sensor with Alexa, and allows you to have all the data without going through Weather Underground, but it’s a little on the pricey side. 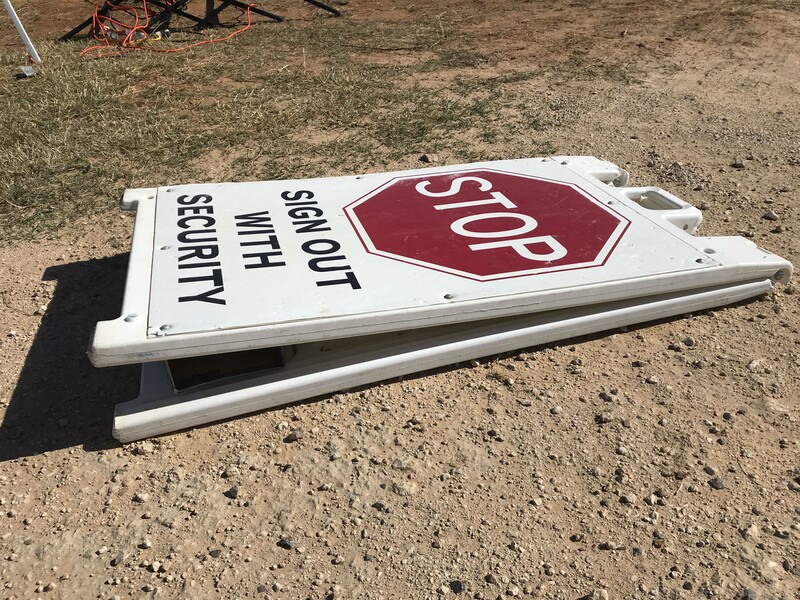 This entry was posted in Lakeside and tagged Acurite 5 in 1, RVing in high winds, weather station, Work kamping Gate Guarding. Bookmark the permalink. Have Lee drill the drop rods deeper with a masonry bit. Exactly, you use this as an excuse to buy new tools. Tracy, Lee needs new tools. I hate wind. Jack looks right at home. 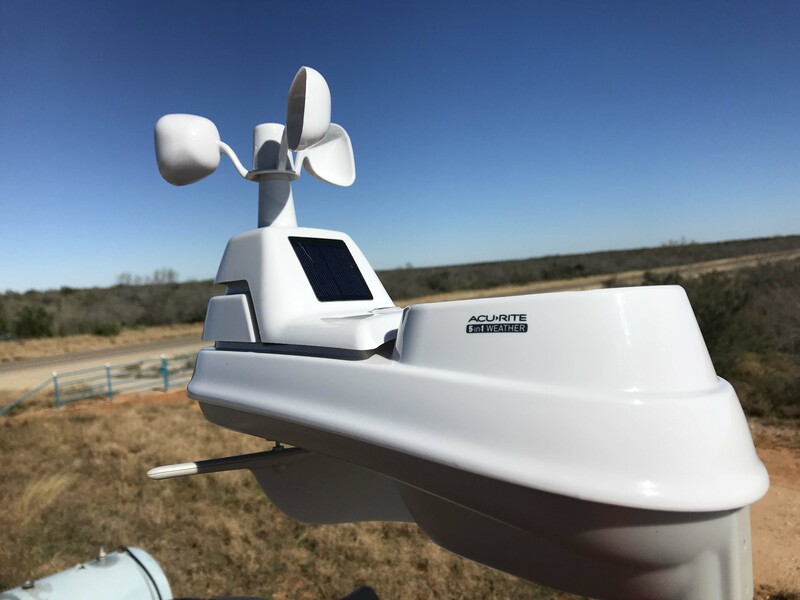 I LOVE Lee’s new weather station. 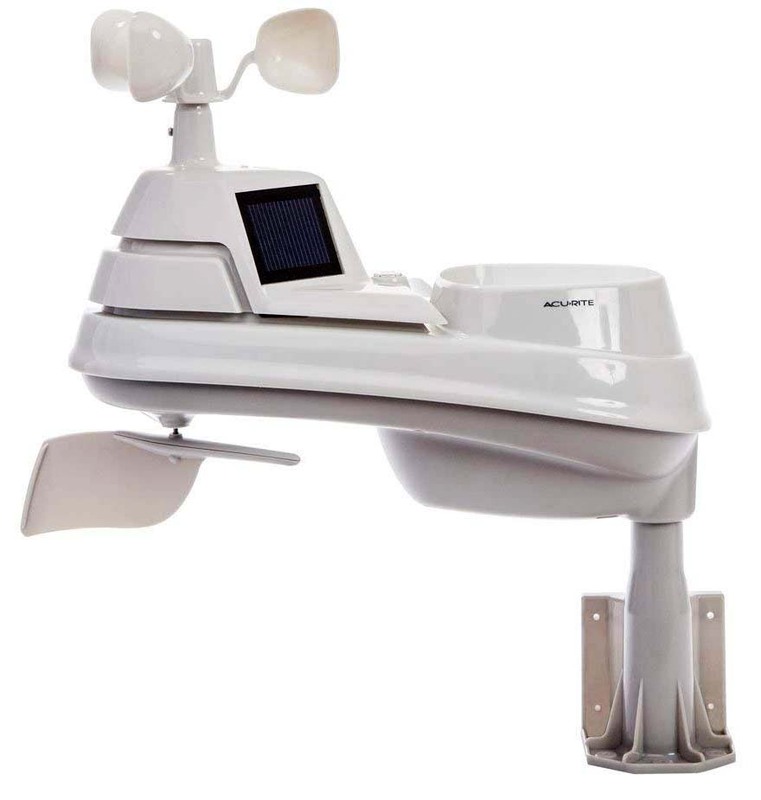 I’ve always wanted one for wind speed and rain. We have a simple one. Thank you for your detailed posts, and for the effort you make with this blog. It is informative. I will never have an RV, but we are thinking about pulling the plug on life here in NYC, and moving to Asia. The prospect seems to be exhilarating and yet daunting, so it is really worthwhile to read about your day to day life. Your lifestyle is different, and you describe the ups and downs well. I wish you and your husband many blessings this Christmas. Thanks and wow that is exciting!! I know a couple people who travel in Asia and they seem to love it. That’s a huge leap though. Good luck!